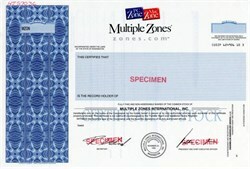 Beautiful specimen certificate from Multiple Zones printed in 1988. This historic document was printed by the Security-Columbian Banknote Company and has an ornate border on one side. This item has the printed signatures of the Company's President, and Secretary, and is over 26 years old. Zones, Inc. was a single-source direct reseller of name-brand information technology products and services to the fast growing small- to medium-sized business market. Zones sold these products and services through specialty print and e-catalogs, inbound and outbound account executives and the Internet. Zones offered more than 150,000 products from leading manufacturers including Apple, Compaq, Hewlett-Packard, IBM, Microsoft and Toshiba. Incorporated in 1988, Zones, Inc., was headquartered in Renton, Washington.